To most automotive enthusiast, driving a manual is not a problem and most would appreciate a properly executed heel and toe downshift. However, not everyone is a petrolhead and given the fact that manuals cars getting rarer by the day, there are bound to be drivers that forget how to operate a manual. 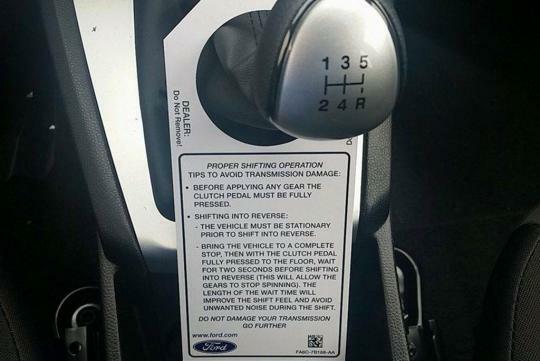 To prevent the owners from damaging their manual gearbox, Ford has started leaving an instruction tag on the gear lever of its manual cars in the States. Posted by Jalopnik, the above photo was shot by by a Fiesta owner who just got his/her car. 2s reverse gear shift rule is somethin new to me..
Driving a manual all my life... took the "complete stop before engaging reverse gear" for granted. Another common mistake that drivers make, is failing to come to a complete stop before engaging Reverse gear, resulting in a grinding sound from the gearbox, and vice versa. And manual gears can be played around. Not necessary to always engage first gear when moving off from stationary. If you are moving off from a downwards slope, can move off in 2nd gear. You can also change from 1st to 3rd gear if after moving off from 1st gear leads you to a downwards slope. And use 2nd gear as engine brake when going down car park slopes, to prevent brake pad fade. That's the magic of a Manual. cos in US, you can get your license using auto car and then drive a manual. The same instructions printed on our Fiat Doblo Panorama manual. We follow accordingly.